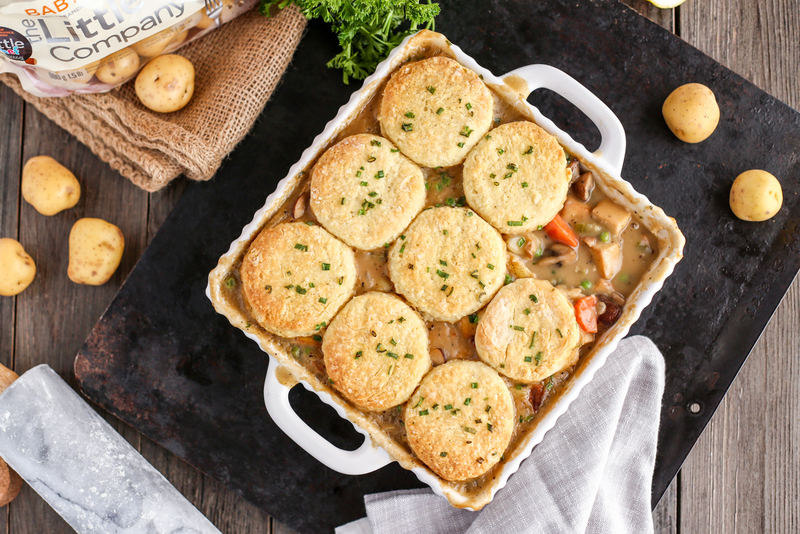 This hearty vegetable pot pie is loaded with seasoned tofu, potatoes, mushrooms, carrots, celery and onion. The foolproof biscuit topping makes this classic comfort food fuss-free! Marinate cubed tofu in 2 1/2 cups of vegetable broth and two tablespoons soy sauce for at least one hour. Reserve leftover marinade. In a large skillet, heat one tablespoon vegan butter over medium heat. Add crumbled tempeh bacon and cook, stirring often, until crisp and fragrant. Set tempeh bacon aside and leave any residual butter in the pan. Add an additional 1/2 tablespoon of vegan butter to pan and sauté mushrooms until golden-brown and tender. Set mushrooms aside and leave any residual butter/mushroom broth in the pan. Increase heat to medium-high, and add an additional 1/2 tablespoon butter to the same pan. Add cubed tofu and cook, stirring often, until cubes are golden-brown and crisp on nearly every side. Set tofu aside. Add 1/2 tablespoon butter to the pan and cook onions, celery, and carrots until onion is tender and translucent. Add minced garlic and cook for one minute. Add 1/4 cup all-purpose flour and cook, stirring often, for two minutes. Discard bay leaf and stir in bacon, mushrooms, peas, coconut cream, and parsley. Bring to a simmer. Taste and adjust seasoning if necessary. Transfer to an 8″x8″ baking dish. Add the chilled vegan butter to the dry ingredients. Use your hands to cut the vegan butter into the ingredient mixture. Continue working the vegan butter into the dry ingredients until the mixture resembles fine crumbs. Add the soy milk and use a fork to stir the ingredients. Do not over-mix. As soon as the mixture is just combined, turn it onto a floured kitchen counter. Knead about 8 to 12 times before rolling out to 1″ thick. Cut out 9 2″ diameter rounds. Top stew with biscuits (3″x3″). Brush with melted butter and top with a sprinkle of herbs, etc. To limit any possible mess, place baking dish on a baking or cookie sheet (in case the stew boils over in the oven.) Bake for 20 to 25 minutes. Biscuits should be golden brown on top and cooked all the way through.